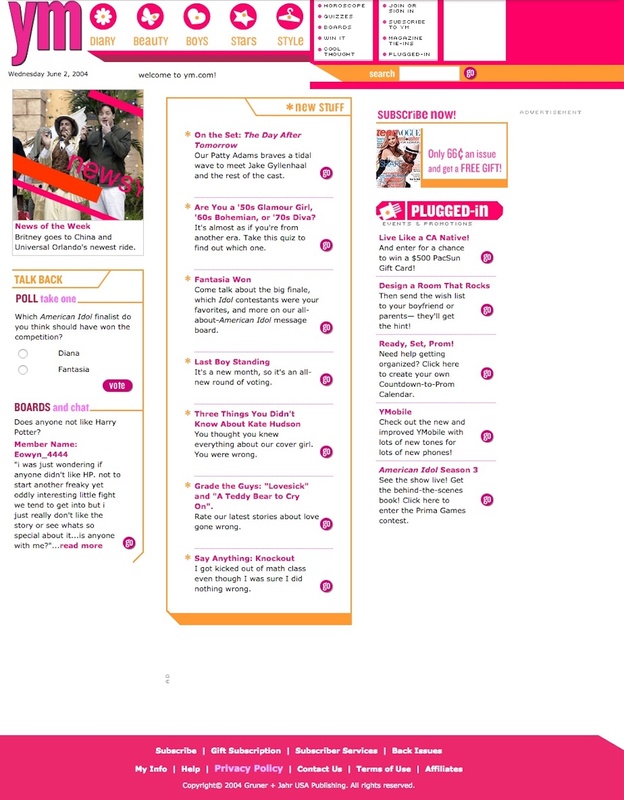 From 2001 – 2004, I was Technical Director of YM.com, the website for YM Magazine. Over the course of my time at ym.com, the website won two awards from MIN: Best Site Integration with Print (2003) and Best Redesign (2004). In late 2000, YM Magazine decided to transform ym.com from a six page website which only featured sparse online content, marketing materials, and subscription information to a fully developed companion website that truly complemented the print magazine. They hired Andrea Pyros to lead this effort as Editor-in-Chief of the website. Her mission was to grow the online experience to better enable the magazine to engage with their readers; but to realize her vision, she needed a team. I had known Andrea for years and after helping her with several small projects for YM, I accepted a full time position to help her and team to transform ym.com into a destination website with original daily content, robust message boards, expanded marketing materials and integration, data analytics, and subscription tools. Creating daily content updates including: static content, site features, weekly polls, quizzes, site graphics, and bi-weekly newsletters. Working closely with editorial, sales, marketing, circulation, fashion, IT, and business departments to manage current and future site development and maintenance, increase site exposure and ad revenue, and create promotional features. Designing, creating, and programming innovative interactive editorial and marketing features and tools from storyboarding, development, and deployment. Managing massive site redesign from planning, site schematics & wireframes, development, migration, transition, and testing the redesign integration. Programmed and monitored website within InterWoven TeamSite CMS. Creating bi-monthly newsletters, which were sent out using Doubleclick’s DartMail tool to over 650,000 users. Building and managing development of Community Bulletin Boards and Chat Sessions where our users could communicate with others on a variety of issues. Implementing and creating advertising and circulation banners, code, and promotions. Assisted editorial staff with copy editing, print/website integration, writing quizzes, interviews, and movie/music reviews. Over the course of three years, our five person team, along with help from the YM Magazine staff, was able to grow ym.com from a six page website into robust web destination with original daily content, highly active message boards, and a subscribed email readership of over 650,000 users.